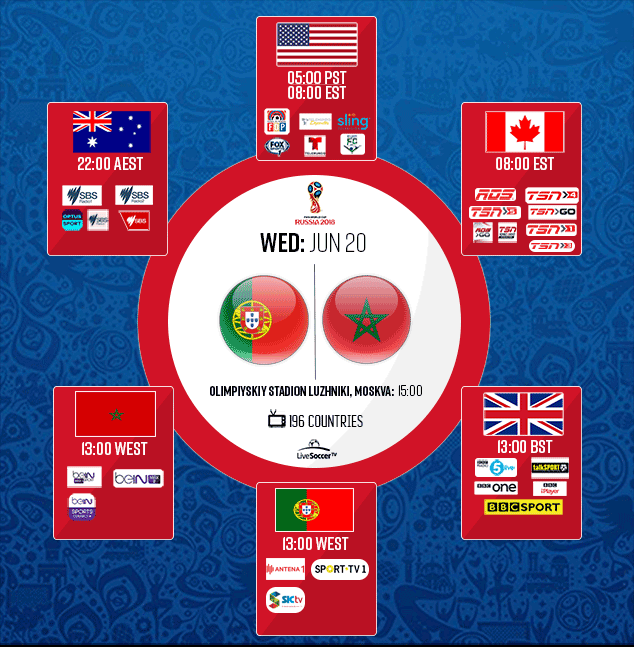 June 19, 2018 By Ali M.
Here is a comprehensive compilation of TV schedules and listings for Portugal's World Cup clash with Morocco. Portugal's second World Cup match is right around the corner, but the heroics from their opening tie is still fresh on everyone's memory. Despite taking on Spain, a favorite to win the title, Fernando Santos' crew earned a hard-fought 3-3 in thrilling fashion. Cristiano Ronaldo stole the show in that game, as the captain scored an amazing hat-trick. A first-half brace was followed by a spectacular free-kick goal which rescued a point with only a few minutes remaining on the clock. Morocco held dreams of pushing for qualification into the knockout stage but saw that go up in flames when they lost 1-0 to Iran. An own-goal in the 95th-minute saw the North African side lose 1-0 in their opening game. One thing that could give the Lions of Atlas a glimmer of hope is Portugal's defensive frailties. While Cristiano excelled in attack, Pepe and Jose Fonte struggling to protect Rui Patricio. Ronaldo will nonetheless be a handful, but Mehdi Benatia will be keen on stopping the Real Madrid superstar. Goncalo Guedes struggled to make an impact in the game against Spain and could thus face a fight to keep a hold of his starting position. Quaresma will be knocking on the door, however. The manager might be keen on reorganizing his defense but might not make any drastic change to his back-four until the Iran game. As for Morocco, they will be without Nordin Amrabat after he suffered a concussion in their opening day defeat. His brother Sofyan could deputize in his absence. The last time these two sides met at a World Cup was in 1986 and Morocco beat Portugal 3-1. That encounter was the one and only time these two nations locked horns. The European side has lost only once in their last six games but has won only twice (D3). The North African nation similarly has suffered a single defeat in as many matches but has enjoyed four triumphs (D1).